When I heard about such an existence of a red velvet layered cheesecake cake, I knew that it was a special present sent from the baking angels of Heaven. Red velvet is one of the finest creations man has ever made, but then to smoosh a big creamy layer of cheesecake in the center too? Genius, pure genius. I'm still having trouble with making layered cakes look pretty. This one was no exception - it was uneven and the frosting was so hard to keep pristine from the red velvet crumbs. 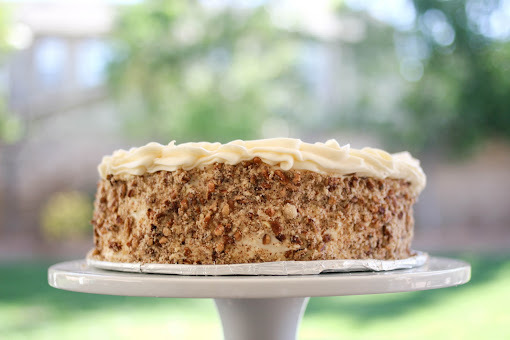 I covered the outside of the cake with some crushed nuts to hide my messy frosting job, but despite all that, nothing could beat how this cake looked cut! Seriously people, perfection! Taste wise, I can say no less. How could it not be good?!! For the cake, preheat the oven to 350 F. Sift together the flour, sugar, baking soda, cocoa and salt into a medium bowl. Beat the eggs, oil, buttermilk, food coloring, vanilla and vinegar in a large bowl with an electric mixer until well combined. Add the dry ingredients and beat until smooth, about 2 minutes. Divide the batter evenly between 2 greased and floured 9-inch round cake pans and bake for 25 - 30 minutes, rotating halfway through, until an inserted toothpick in the center of the cake comes out clean. Let cakes cool for 10 minutes, then invert each onto a plate, then invert again onto a cooling rack and let them cool completely, then level. To make the cream cheese frosting, cream together the cream cheese and butter in a stand mixer until creamy and smooth. Turn the mixer on low and add the vanilla and salt. Then add the powdered sugar slowly. Once mostly incorporated, turn back to medium-high and beat until light and fluffy. To assemble the cake, place your bottom layer of cake on the dish/ plate you will be serving it on with the leveled side facing up. Spread a thin layer of cream cheese frosting on top - it doesn't matter how messy it looks since it will be covered. Transfer the cheesecake to the top of the cake, then spread another thin layer of cream cheese frosting on top of the cheesecake. Top with the remaining layer of cake - leveled side down so that you have a clean surface. Use the rest of the cream cheese frosting to frost the entire cake. Enjoy! Not the prettiest cake, but sure the tastiest! This looks amazing! 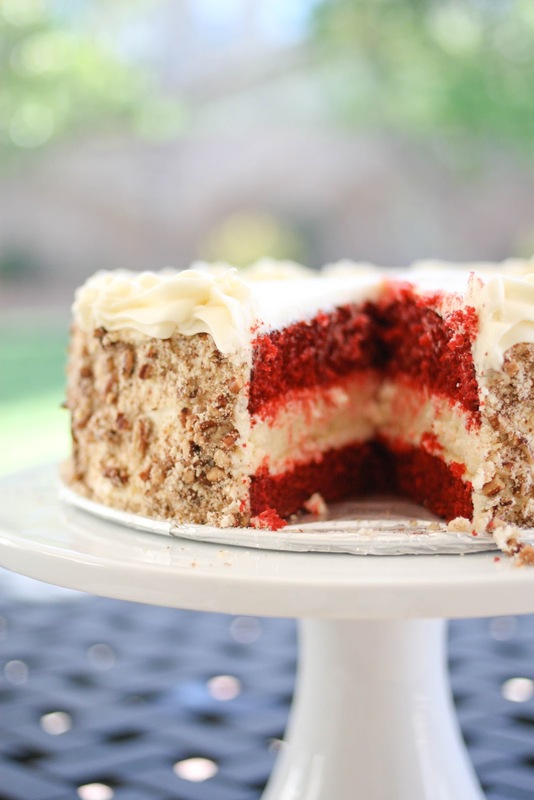 My bakery does this but it's just one layer of red velvet cake and the bottom layer is the cheesecake. Have you tried a red velvet cheesecake sans cake? I want a slice! Do you deliver to Pasadena? 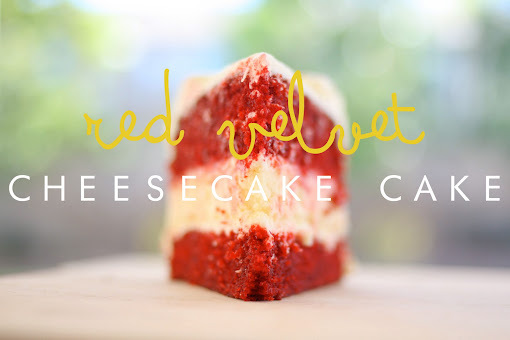 Red velvet... CHEESECAKE cake?! How have I not heard this. Definately making... sharpish. Red Velvet Cheesecake Cake!! look at that madness! For the cream cheese frosting? What is the name of the cursive font you use? It's super cute! Um, can we saw A-MAZING! This looks absolutely delicious and your cake looks perfect and beautiful! OMG! My two favorite desserts combine! I might have just died and gone to heaven. Yes, could you post the cream cheese frosting part? a cheesecake within a cake! YUMMM! what a wonderous idea! My mouth is watering with the expected decadence of this beautiful looking cake. Wow! Thanks so much, I am so making this, going to be beautiful served up for thanksgiving. Not the prettiest cake? Hello? This is the MONA LISA OF DESSERTS! WONDERFUL. Thank you. First, your pictures are so beautiful! Second, I too have an undying love of red velvet and actually made something similar a while back! I just stumbled upon your blog and love it, it's adorable. I may not be up to your standard but I think you would enjoy my savory take on food. check it out! If it wasn't so late right now, I would seriously jump up and go make this. Oh man, it looks and sounds AMAZING! I think you did a good job with the layering. I'm generally not a fan of food coloring but this looks so fun and festive, I can't resist. Sounds absolutely delicious, too! how many eggs go into the cheesecake part? I am currently making the grocery list! I mean, it looks good enough to me! Imperfection is often the sign of quality, as you know it's not store-bought! I baked this cake for my mother's birthday, since she loves cheesecake and red velvet. It was a huge success, and everyone in my family loved it! They all went back for seconds, even after having eaten a huge dinner before. Thanks for the idea and recipe! It was delicious! oh my god, that looks so nice ! 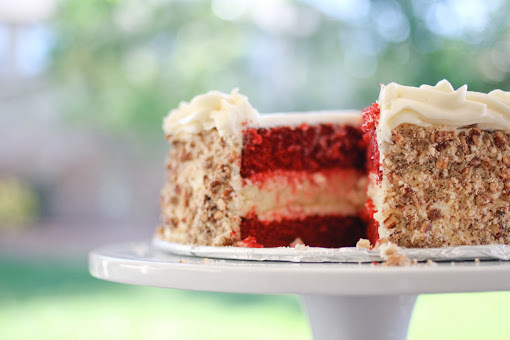 I am going to make this for a friend's birthday - cannot wait and I'll be there to eat a piece with her! lol Oh, the benefits of friendship:-) Your cake looks amazing and your layers . . . they look beautiful to me! I made this last Christmas for my moms family and this year am making it for my dads family and my husbands family. This year I'm putting red edible glitter in it to jazz it up. This is the best recipe, even if mine doesn't look as gorgeous as yours! This looks amazing. Gonna make it for 4th of July and make one of the layers "blue velvet" for red white and blue cake! Yum!! I sure am gonna make this tonight for my fiance's birthday tomorrow!! 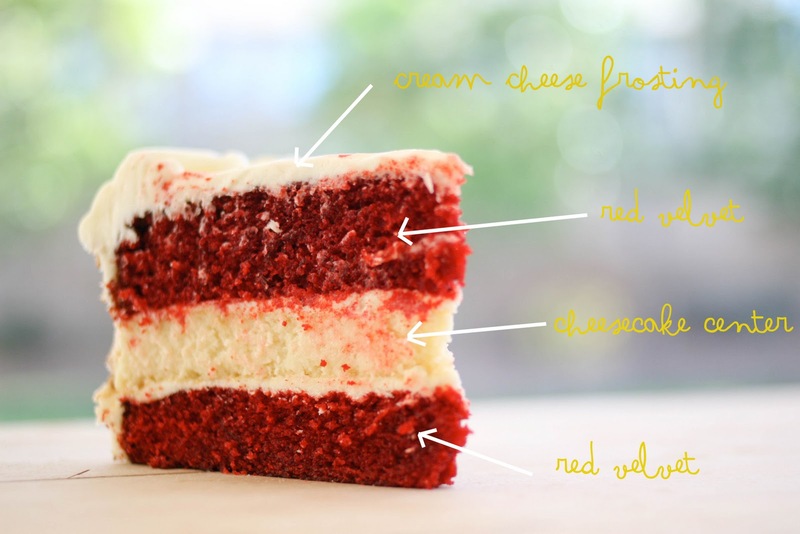 The red velvet cake in your recipe is similar to his grandma's making... so to add cheesecake is a fantastic idea!! The only concern I have is the melting white chocolate. I've always had a difficulty time with melting the white chocolate (we love to dip the strawberries in the white chocolate, yum!) do you have any suggestion for me how to melt the white chocolate? One thing more---do you suggest us to use the white chocolate chips or the baking bar? I can not wait to make it tonight! YUM!